Book your British rail ticket online here. You can also get the British rail route planner before you set out on your journey. 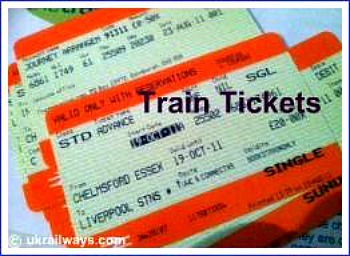 Lean the tricks to cheap rail travel in the UK as well as different rail ticket types for your journey. Book your British rail ticket online here and use our route planner to refine your journey plans before setting out. It could save you tons of time and pounds. Talking of British train tickets, where exactly are you hoping to go to in Britain? If you are planning to visit Britain, London, Edinburgh and Cardiff are the top cities often visited in this Kingdom. They represent capital cities of England, Scotland and Wales, the three main "countries" of the United Kingdom. Northern Ireland is fourth country making up the UK. All the major UK Train Operating companies operate a single ticket purchasing system, making getting a rail ticket to any part of the UK as easy as it could be. You can buy cheap train tickets here now , and save from 43% or more on the cost of your rail journey, compared to if you purchased your ticket at the station on the day of travel. The sooner you buy your train ticket the more your chances of significant savings on your journey to any destination in the UK. You can buy your rail ticket up to three months in advance and save up to 78% on your ticket! If you are new to Britain, there are a few facts you need to know about British train tickets. They come in different types. For clarity, we will divide them into two main types and then subdivide them further to help you work your way through them and understand which of them would be suitable for your journey. Inter-Country Tickets or Passes. If you hope to travel on train from France for example through Europe and then into England, you may not be able to use your Inter-country Pass such as Eurail Global Pass. These are not accepted on British trains. What you require would be the BritRail Pass. You can buy these outside Britain or online at Rail Europe website. Intra British Rail Tickets. These are the regular rail tickets used in trains across the UK. They come mainly in three types - the Advance Tickets (bookable many many months ahead and often discounted); the Cheap Day Saver (bookable a few days or same day of travel and comes at a discount but with restriction on tine of usage and generally not refundable) and the Open Ticket which can be bought in advance or same day of travel, but has no restrictions. This last type of ticket is typically more expensive, though brings with it great flexibility of use in terms of travel times and ability to get refunds if things go wrong. Especially if you are new to England or indeed anywhere in the UK, taking some time now planning your rail route could save you lots of time, frustration and money later. Use our excellent journey planner and get train times and ticket price. Just enter your proposed destination and where you are travelling from into the box below, choose the date and time as well as if return journey or one way. Click "Get Times & Tickets" and this brings you even finer planning options on your British rail route planner. Then you will be able to study the different train ticket types offered and see what might work best for you. Travelling in Britain is expensive and you wouldn't want to throw money way. You can get more information on ticket types and journey planning in the UK by visiting the National Rail website. Return To Home Page From British Rail Ticket Page.